The Darlington SWCD hold a meetng once a year to honor an individual or group for efforts made on their behalf promoting natural resource conservation in the county. This year the meeting was held at Randell Ewings cabin in Dovesville, SC. A meal was served consisting of charcoal grilled pork loin, baked potato, potato salad, butter beans, slaw, and barbecue bread. The weather was perfect and many thanks to all for the food and good company! 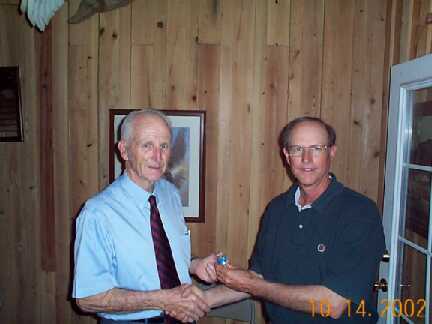 Flowers Forestry Service has been named the Darlington SWCD cooperator of the year for 2002. 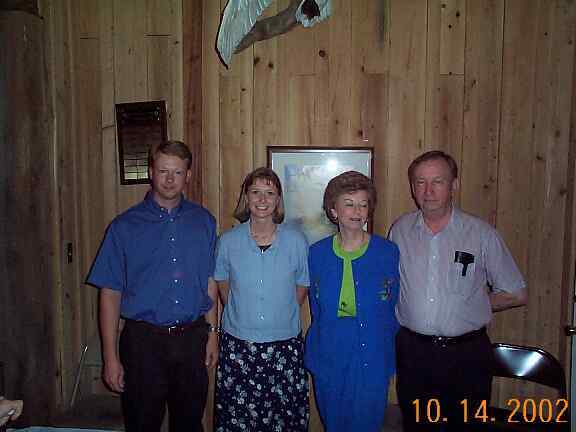 Pictured are from left, Corey, Kristie, JoAnn, and Billy Flowers. Flowers Forestry has promoted conservation practices such as tree planting, riparian buffers, filter strips, controlled burning, and wildlife mgmt. David Allen, left, was awarded his 35 year pin for service as commissioner for the Darlington SWCD by Jim Chapman on behalf of the SCACD.